The gigantic monument to the first king of the new Italy Victor Emanuel II (1820 to 1878) is one of the largest monuments in Europe. It was planned and built after the king’s death, but was not completed until 1927. The Monumento a Vittorio Emanuele II (Italian name of the monument) is a 12 meter high equestrian statue of the former king of Italy. The monument appears powerful above all by the gigantic building belonging to the monument behind the rider with gigantic columns, terraces and stairs. At the top is a quadriga, a chariot with four horses. In Italy, the monument is often simply called „Vittoriano“. 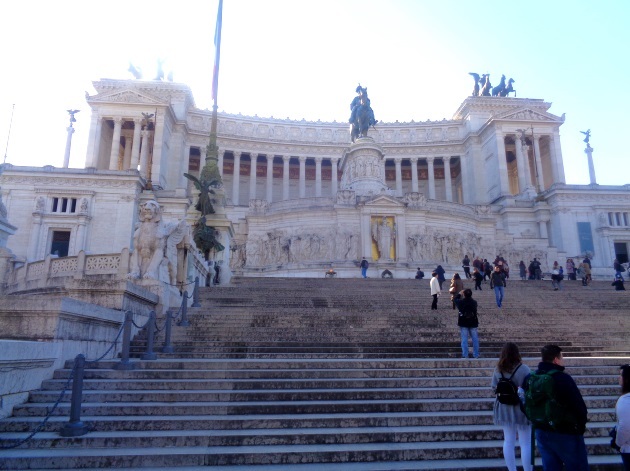 Also the patriotic name „Altare della Patria“ (altar of the fatherland) is often heard in Italy. The architect of the monument was Giuseppe Sacconi. Planning began in 1878, immediately after the death of King Victor Emmanuel II. Construction began in 1885. It was inaugurated in 1911, although the building was far from finished. This was only the case in 1927. After a bomb attack on the monument was carried out in 1969, it was not open to the public for over 30 years. Since the year 2000, the gigantic equestrian monument can be seen again. 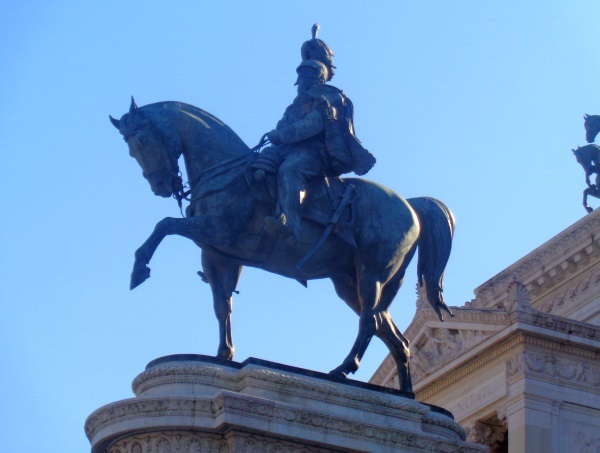 The monument Victor Emanuel II belongs today to the Top 20 sightseeings in Rome. As is often the case internationally with big national monuments, there is a tomb for the unknown soldier at the monument Victor Emanuel II. Today, 2 soldiers are on guard around the clock. 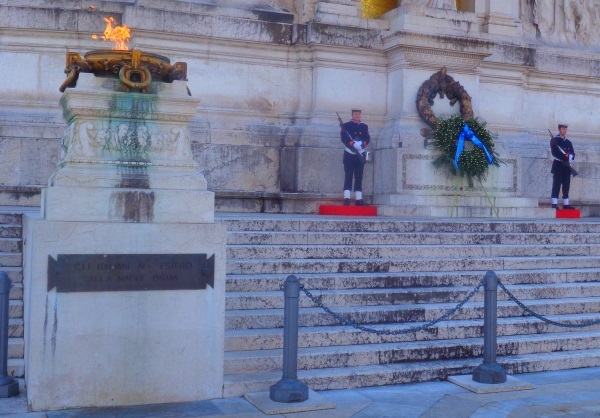 In the monument Vittoriano is a small museum (entrance 5 euros, with discount € 2.50) called „Museum Risorgimento“. It shows historical things from Italy from the 19th century. Those who are fit can climb some more stairs inside the building. About the height of the rider there is a large terrace with great views. You can walk around the monument Monumento a Vittorio Emanuele II on the terrace. At the back there is also an elevator that takes you up to the roof of the monument. However, this costs quite a lot: 10 euros. Directions Monument Victor Emanuel II: It is about 600 meters west of the Colosseum Rome. There is also the nearest underground station. If you don’t want to go that far, you can take one of the many bus lines that stop near the monument. Not far away is also the Tiber Island and the Circus Maximus Rome. The Forum Romanum is almost next to the monument Vittorio Emanuele II and is partly visible from the terrace above.